Removing information from an email you forward is as simple as editing the message prior to hitting send. And yet, sometimes not quite that easy. How do I remove the senders address form an email before forwarding it? 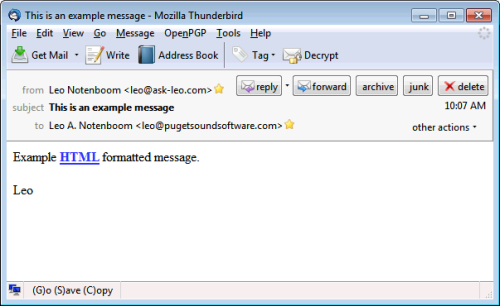 I am using Mozilla Thunderbird email. I'm kinda surprised at how often I get this question. As someone who's used email now for well over a quarter century, I take for granted how conceptually easy it is. Clearly, given the number of times I get asked this, it's certainly not obvious to everyone, so I'll walk through the steps. I'll use Thunderbird, but the same concepts apply to almost every email program I've ever encountered. Very simple, from me to me, using two of my email addresses so you can see the difference. The original message has been placed in the body of the new message, ready to be forwarded. At this point you might add your own notes and comments before forwarding the message to someone else. The key that many people miss is simply this: the original message is just a part of the body of your new message and can be edited. And the sender, the From: line, is gone. 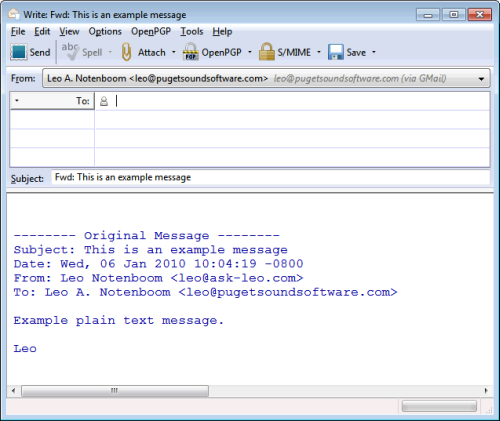 The above example was a simple, plain text email. With some emails, the HTML can end up being very complex; particularly emails composed using overly powerful HTML or word processing programs as their email editors (I'm not mentioning any names here, but let's just say that the outlook isn't good). So let's review the example with an HTML formatted email instead. And once again I simply select the text I want to delete and delete it ... or do I? This is where it gets ... weird. When I click in or around the "From:" line I get these grey lines around the email message's header. In fact since we're forwarding in HTML format, what Thunderbird has done is formatted the header of the email that you're forwarding into a table with two columns, and 4 rows. Many email programs actually do something very similar. But it does make editing a little more difficult. I delete character by character because it's too easy to select too much with your mouse. And if you select data that cross from one cell into another - delete often doesn't work. This is the source of most people's confusion and frustration. If you're not using Thunderbird, exactly what your email program does with this scenario will vary slightly. The most common difference is the mechanics of deleting table cells, table rows and the like. With complex emails - often those that have been forwarded repeatedly without being cleaned up - you can end up with tables inside of other tables, often nested several levels deep. It can get quite confusing. "Just because you got the email in HTML doesn't mean you need to forward it as HTML." There's at least one constant: you can click within a table cell and delete (or alter) its contents with the delete and/or backspace keys. So you can almost always find and remove the sender's address. There's another, perhaps simpler, way. Just because you got the email in HTML doesn't mean you need to forward it as HTML. And the conversion to plain text removes all of the complexity. In Thunderbird, you can hold down the shift key when you click on Forward, and it will choose the "other" format - meaning that if forward defaults to plain text, shift+forward gets you HTML, and vice versa. You can see that all the formatting has been removed (and in the body, some has been replaced with plain text pseudo-equivalents). The header of the forwarded message is now just plain old text that you can edit as you like. A closing note: the ease with which we can edit a message before forwarding it should be a warning to you. We've just edited the header to remove the "From:" line, but there's nothing preventing you from editing the body to make the message say something it did not. The lesson? It's trivial to fake email. Always consider the circumstances, and keep a healthy dose of skepticism on hand at all times. Why shouldn't I forward this email asking me to "forward to everyone I know"? Every few days we get forwarded email warning us about everything from lost children to free money. They're mostly bogus and known as "Urban Legends". 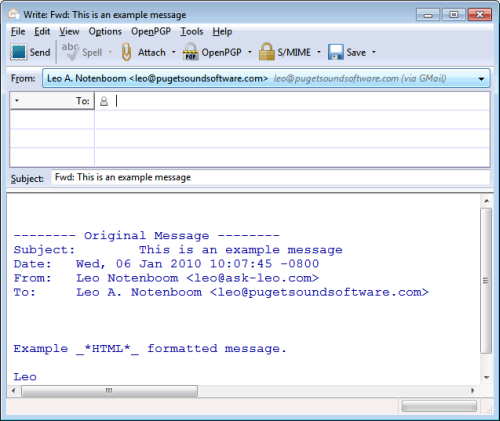 Most modern e-mail clients do not show the full header that is contained in an e-mail. Will deleting the "From:" portion from the visiable fully remove this information from the hidden portion of the header? Even if it does, I'm assuming (please correct me if I'm wrong) that the remaining header information will provide a least a tiny amout of tracking information to the next receiptent, will it not? Good words! However, I have friends who are on AOL and they are unable to edit the original message. I have been on their computer and I could not change anything. This is most annoying, and dangerous in my way of thinking, for they quite often forward stuff to me that has been reforwarded dozens of times and EVERY SINGLE VALID E-MAIL ADDRESS is included! What a bonanze for a spambot. A few usegroups I visited confirmed my experience, saying "...that's the way AOL does it. If you forward something your forward it ALL." Another reason I'm not a huge fan of AOL I guess. I'd be tempted to not use AOLs mail program at all, and rather use something like Outlook or Thunderbird. Some of the users who present a problem like this may be referring to a different type of situation: I receive an email I like very much from you; I want to forward this email to my distribution list without sending a copy to you [you've already seen it]: how do I easily delete the sender's name from my distribution list so I do not duplicate the email for the sender? I know I can open the distribution list, delete the sender's name, and then send -- however, that's just too much work. We used to be able to expand the distribution list once it was designated in the forwarded email; but alas, as far as I know, Thunderbird does not yet have this capability. Any feedback? I've used AOL for years, and a forwarded email CAN be edited using methods similar to those described. 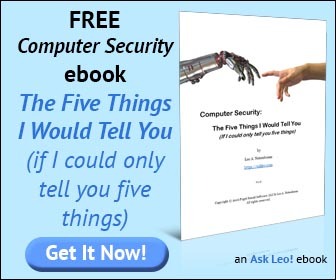 As Leo noted, you do it in the body of the email being forwarded, not in the email you received. Sometimes you have to locate the cell and delete in the cell. Sometimes, instead of forwarding something that is several forwards deep, it is easier to select the part you want to forward, copy it, and paste it into the body of a new email. You can edit further in the new email body. Does anyone know if I can delete the sender's info on my blackberry? After deleting the FROM email address and forwarded. Does the FROM email address show,if the recipient,right clicks the email and clicks on PROPERTIES. Typically no, not at all. I, like others who have commented, have been an AOL user/addict for many years. As discussed, my experience has been the same: the answer to the question depends on how (in what format) the email was created. That said, over the years I have grown to HATE forwarded emails. I have written ranting emails to my friends and family saying that if something you receive is worth re-sending then it's worth copying/pasting to a new mail. It is really bothersome to receive an email which has been re- re- re-forwarded a dozen times. Especially troublesome, in my opinion, are the forwards which show all the dozens (hundreds) of email addresses to which the email was previously sent. Too, on the occasion that I do find something I wish to share I, nowadays, often don't even do the copy/paste thing. I Google what's said/shown in the email, find it on the internet, and simply send a link -- including, perhaps, a brief note about it. (Most crap -- I mean "interesting stuff" -- sent in email you can usually find somewhere on someone's website.) And on a website the message looks better (nicer pictures, easier to read) than in some messed up, badly formatted, forwarded email.... Just my opinion. My problem seems to be a little different. I use Thunderbird as well, but when I forward a message (in WinXP Pro), the forwarded message is almost always inserted as an attachment. How do I edit that? As a courtesy to all the other people whose addresses are included in an email I receive, especially if it has been forwarded many times, I remove ALL their addresses before forwarding. Sometimes I have to do it in "pieces", but it's better than having my friends and family suddenly receiving an email from someone they don't know, even if it's by accident. You seem surprised that so many of your readers are puzzled by forwarding. It seems that the main problem (when using Thunderbird) is that once "forward" is pressed the message is no longer available for editing.I have tried changing settings between attachment and inline etc. but to get around it I send the message to myself in Windows Mail which I keep just for removing addresses. Kind of defeats the advantages of using TB! Might I add a slightly simpler method for 'cleaning up' a FW: email before sending it on? I know that this works in Thunderbird but am uncertain of others. Just drag the email from your inbox to your 'Drafts' folder. The whole thing then becomes yours as if you had written it. You can make whatever changes you deem appropriate and then simply forward it. No cut, paste, copy, etc. This is especially useful for those clever animations and such that just won't copy. Yet another reason for using Thunderbird! I use TB and my question is how do you forward a picture(s) w/o the email addresses that you received? If only. If only people would delete the sender's name I would be very happy. I detest these mail sent in the form of an attachment and then you get everyone's address, - or on the other hand, they get mine. What I am looking for is a little quirky joke that actually told the recipient not to forward until they removed my address. I have just upgraded to Win 7 and so I have lost it. Is there any way to see if a message has been edited after it was originally sent? Not without having the original to compare it to, no. How easy is it to forge or alter email? 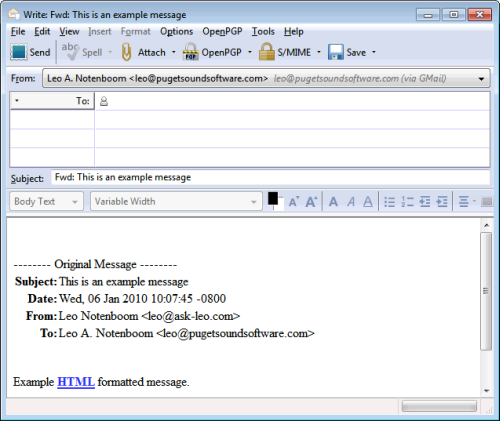 As Marge alluded to on the 28th June 2011, Hotmail (.co.uk at least) no longer allows the user to delete the previous email addresses when forwarding messages. I find this highly annoying as is leaving people at risk of receiving more junk email, and possibly worse. I never had this problem in 25years. My new computer with Win7 DOES NOT allow any text to be selected in any of my email programs (Yahoo, Gmail, and i-page webmail) The only way I can delete the old addresses is to click somewhere in the address add a few letters and then delete them and keep pressing delete until I erase the rest. Takes forever!! !